This amazing Beer Tasting Housewarming Party is one of my new favorite features! 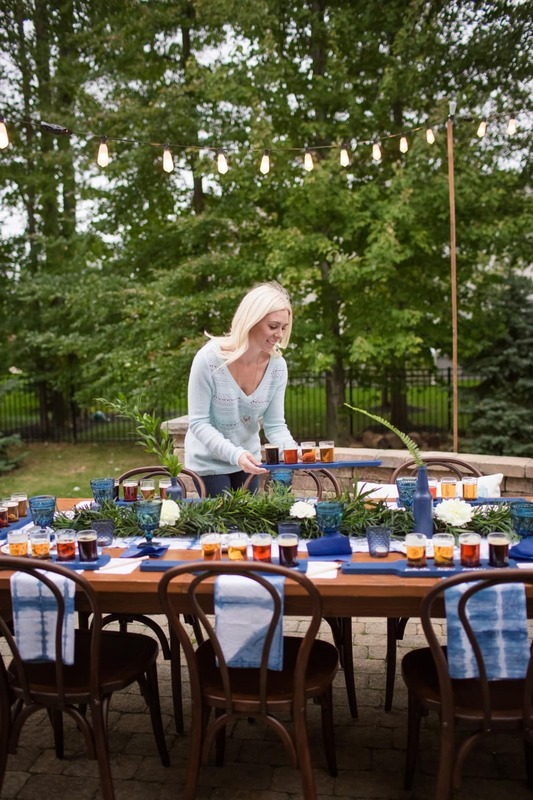 The stunning backyard fete is both masculine while still being cozy and pretty. 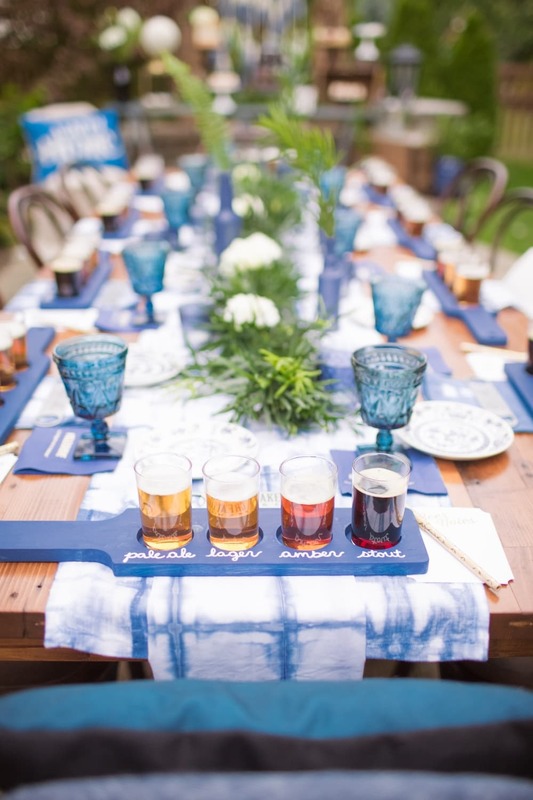 From the gorgeous blue and white combo to the individual wooden tasting trays, Tara Berger of One Stylish Pretty truly outdid herself. 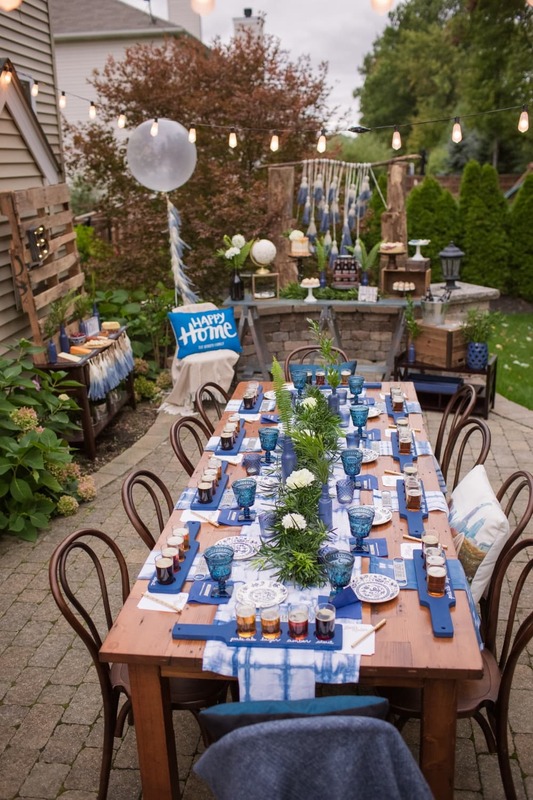 The party decor was inspired by the Freshly Painted Housewarming Party invite from Tiny Prints. 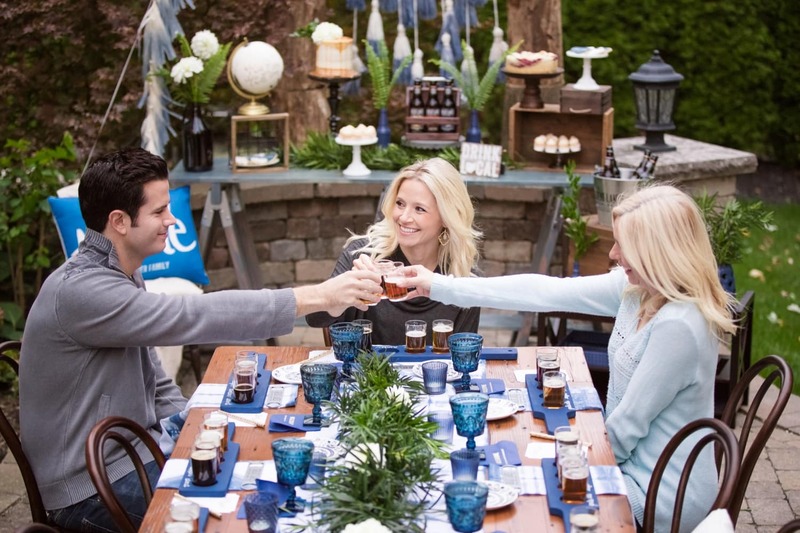 I loved the richness of the blue hues which allowed me to create a masculine, yet cozy vibe for the party. 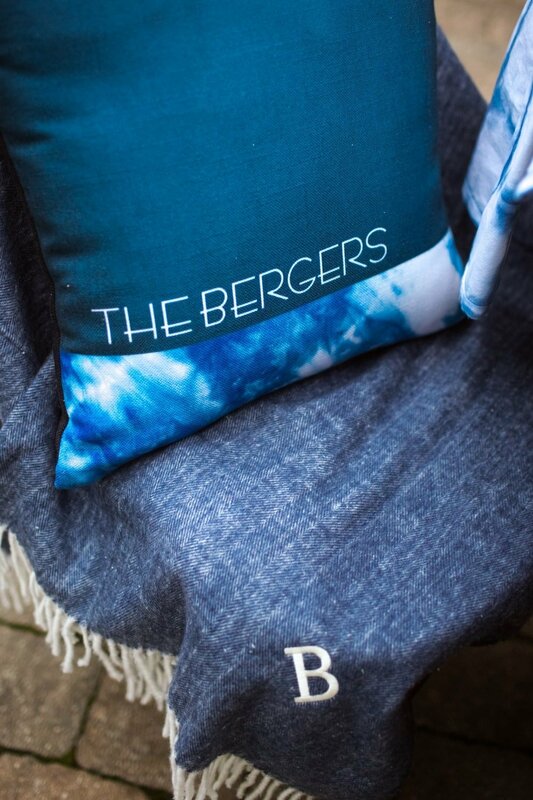 I incorporated lots of throw pillows and soft blankets in the set-up to ensure our guests would be comfortable. 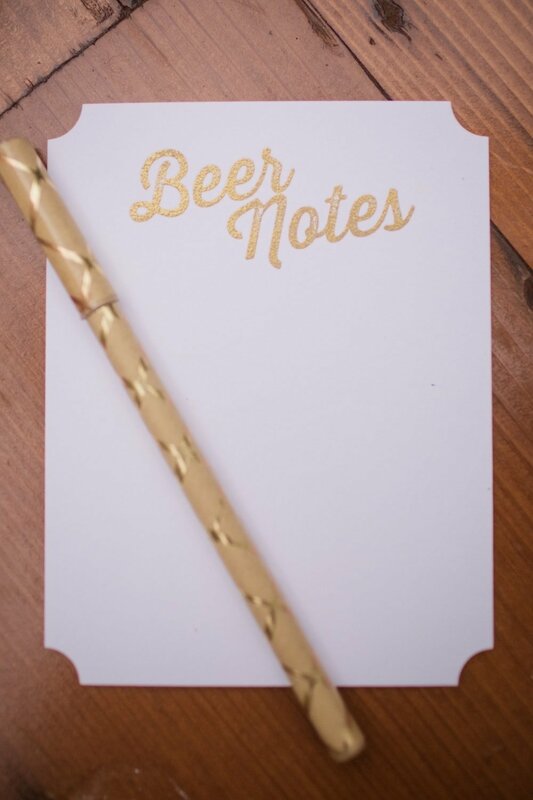 One of my favorite details was the thermography Beer Notes cards at each place setting, which allowed guests to write down details about their favorite beer. 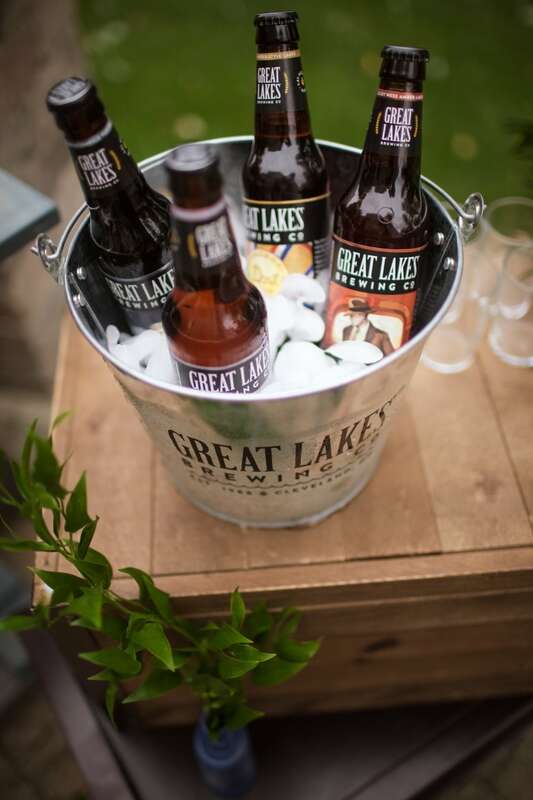 It was important for me to pull in as much Cleveland pride as I could, so I decided to serve beer from Great Lakes Brewing Company which was founded in 1988 as Ohio’s first craft brewery. 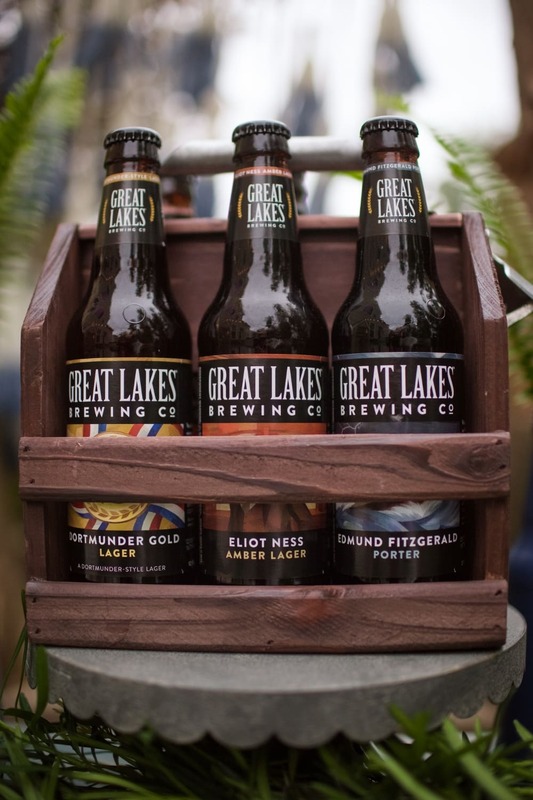 With five year round beer flavors and a variety of seasonal beer flavors to choose from, I was able to create a balanced beer flight for each guest. 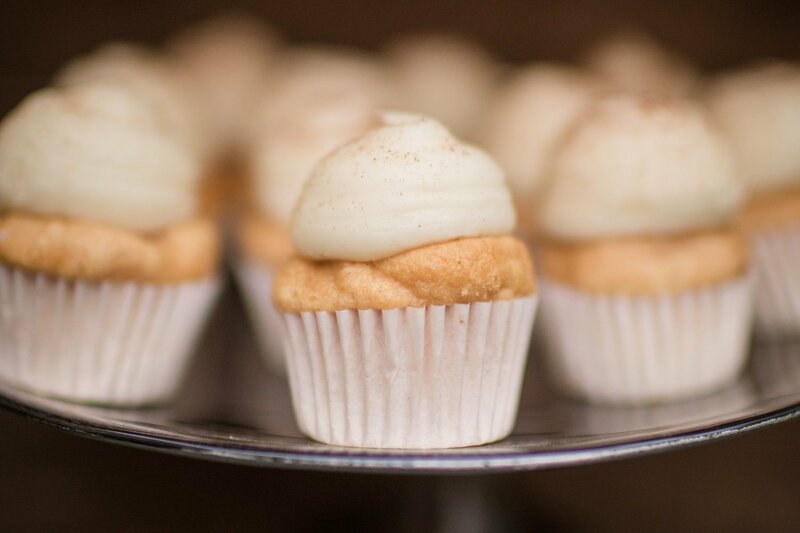 I called upon local Cleveland vendors such as Kelsey Elizabeth Cakes who created Oktoberfest Pumpkin Spice mini cupcakes and an amazing Vanilla Bean Salted Caramel cake. 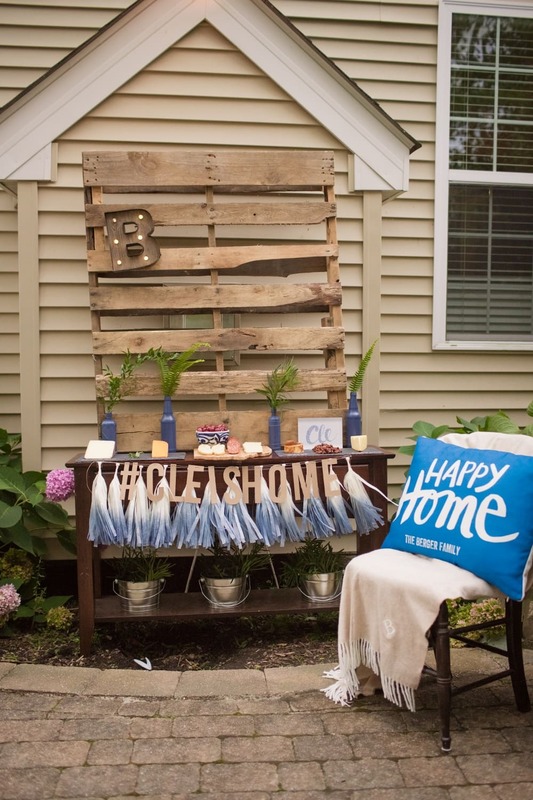 Borrow Rentals was my go-to source for a long farmhouse table made from reclaimed wood in Cleveland, as well as the most perfect blue glass water goblets and mismatched blue china. 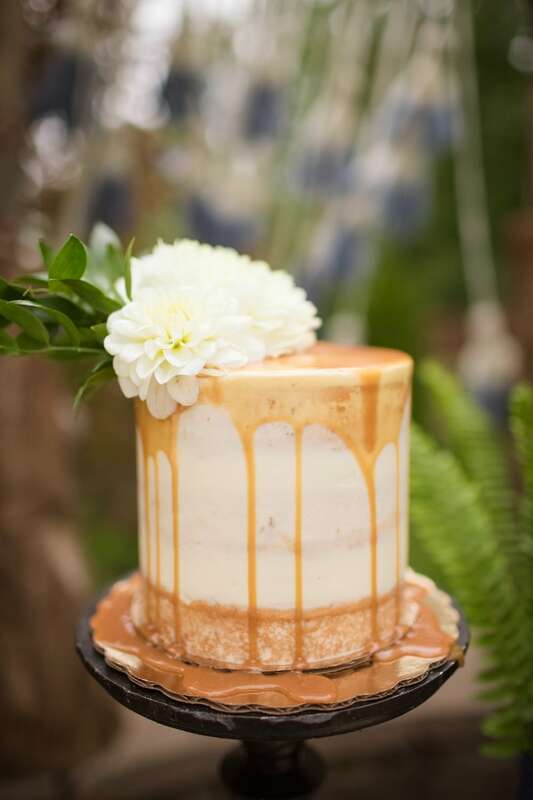 I relied on Life in Bloom to design florals that perfectly complimented our outdoor space and party decor. I’ve always dreamed of styling a greenery garland in one of my party tablescapes and this one did not disappoint! When I spotted a shibori table runner and napkins on Etsy by Carmine Textiles, I knew I had to have them. 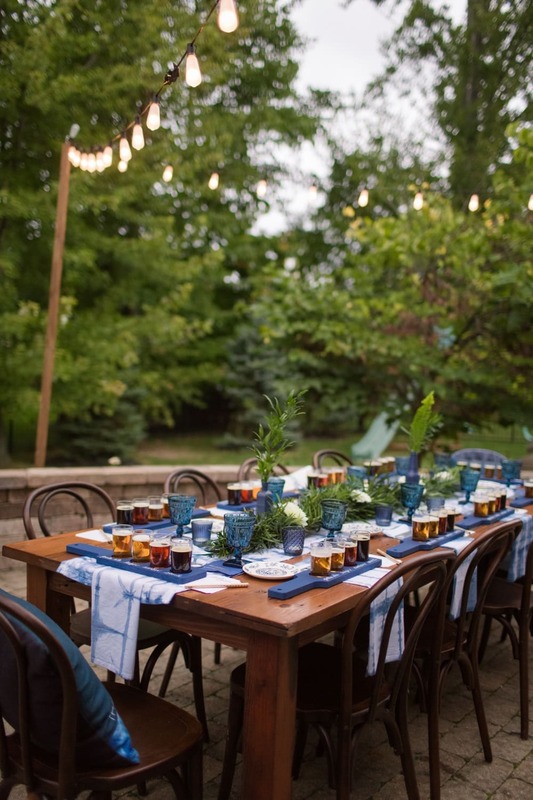 The linens matched perfectly with the party invite and were a key element in tying together all of the blue hues throughout the decor. 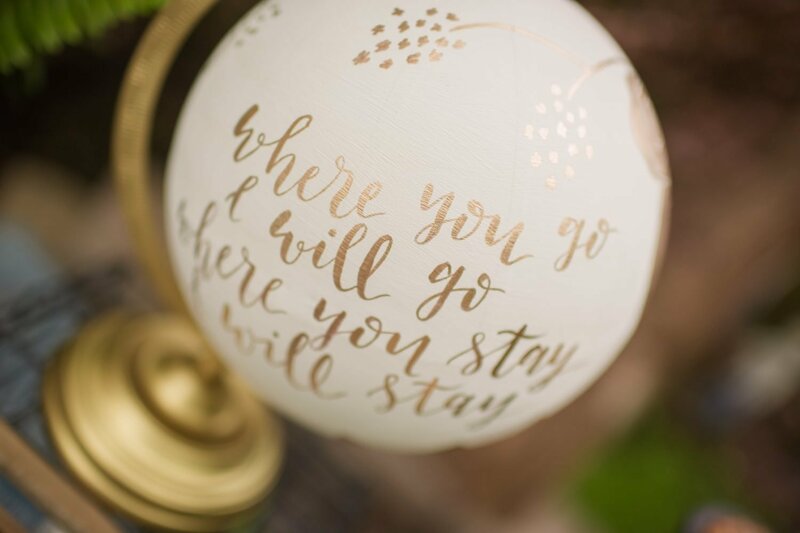 Another one of my favorite details was the hand lettered globe by Carolina Quill with the quote “Where you go I will go, where you stay I will stay” which couldn’t have been more fitting given our circumstances and the reason for the party. In preparation for the party, my husband and I installed edison bulb string lights across our patio, which added so much character and warmth to our outdoor space and provided the perfect ambiance for entertaining guests. It was a perfect night spent under the stars celebrating our new home with new and old friends that are sure to be a big part of our life for years to come! And I am extra grateful to have had all of the details captured by Brittany Gidley Photography, who not only understood my vision, but completely brought it to life through her lens! Spray Paint Your Way to a Stylish Valentine’s Day! Beer tasting party looks like fun. I like those paddle-like trays for the beer glasses. Cheers! 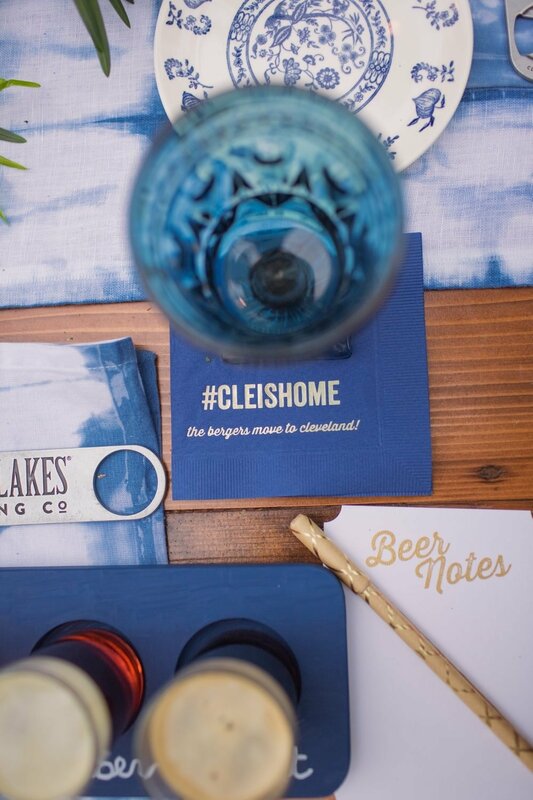 How did you make/where did you get the beer tasting trays? 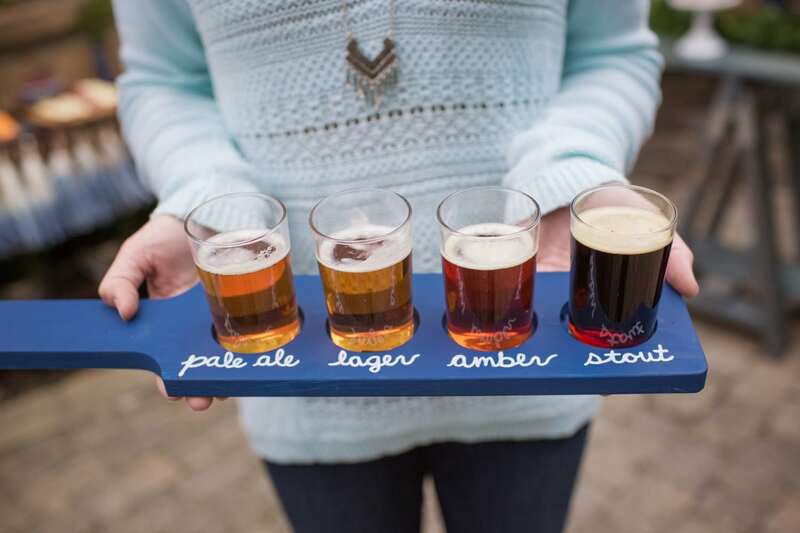 I’d also like to know if you made the beer flights or bought them and if you bought them, where? thanks! Beer tasting party looks like fun. 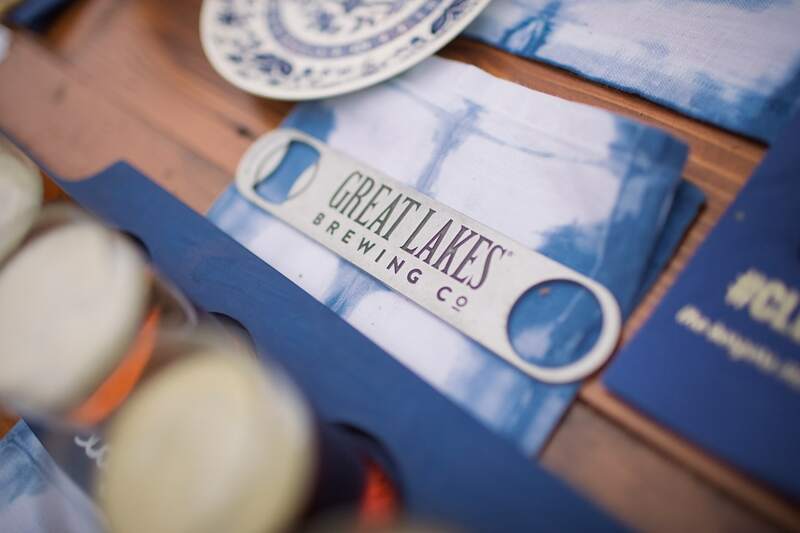 I really love those paddle-like trays for the beer glasses. I saw that once in a local bar in Chicago. Cheers! You gave me some great ideas for a beer tasting party we’re having. Thanks for the link to webstrauntstore, I’m going to pick up some of those beer paddles, those are neat. Your table looks beautiful. I am in charge of decorating for a 1200 person Oktoberfest event for our parish. We will have a VIP area and I am interested in what greenery spray you used on your table. thank you.